If you take a look at our menu, you’ll be greeted by plenty of mouth-watering dishes. Some you may have heard of before and others you may have not. One of the most popular and recognisable dishes from Thailand, however, has got to be Pad Thai. Here at Nine Elephants, you’ll notice this savoury course is named “The Pad Thai”. This pays homage to the definitive dish and just how proud we are to serve it. Along with plenty of tasty street food helpings and fragrant curries, we can’t recommend this particular part of the menu enough. If you’ve never tried this noodle-based delicacy before, you’re in for a treat. Likewise, if it’s a dish you’re familiar with, “The Pad Thai” will be everything you could hope for and more. If you make a quick Google search for ‘pad thai’, you’ll be told that it is a “stir-fried rice noodle dish commonly served as a street food and at casual local eateries in Thailand”. Whilst this is true, there is so much more to this amazing and enticing food. 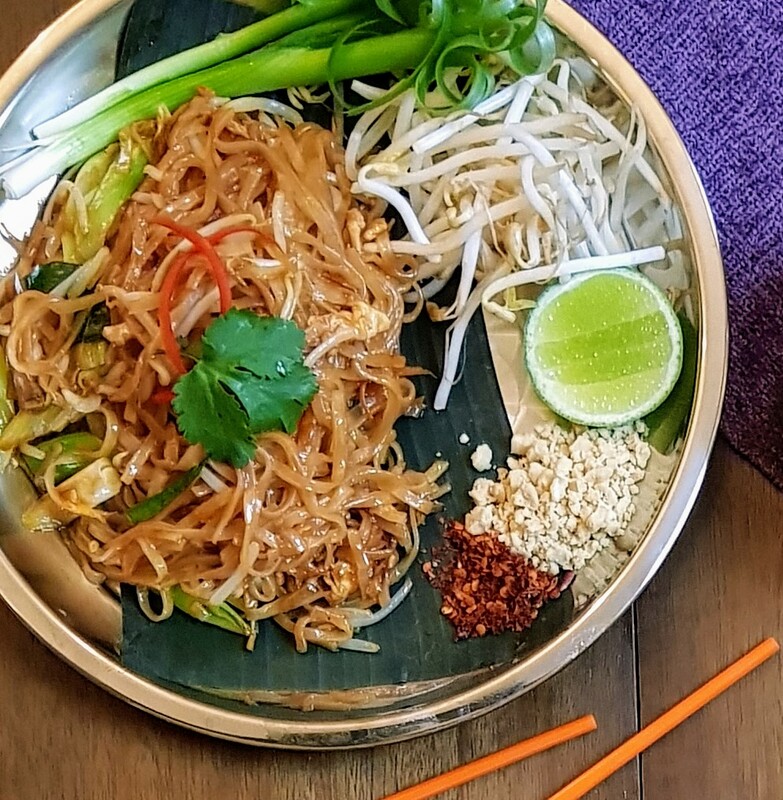 The original name of our favourite savoury cuisine is actually ‘Kway Teow Pad Thai’ and as ‘Kway Teow’ means ‘rice noodles’ in Chinese, we can start to imagine that this dish actually has some Chinese influence. Some people think that early settlers from China brought over the first edition of the dish. That said, let’s go back to the 1930s to discover the most told story of its origins. More often than not, the story of a competition being held is quite frequent when telling the history of Pad Thai. It is said that Field Marshal Plaek Phibunsongkhram, the new prime minister at the time, wanted to make changes to Thailand and make it more Westernised – therefore defining the country’s own culture. Amongst these changes was naming the country ‘Thailand’ as the original name was Siam. The government held a contest to try to find a new national dish. Rumour has it that Pad Thai won! The main ingredients of a Pad Thai are rice noodles, tamarind, fish sauce, sugar, egg and peanuts. There were more benefits to eating the dish than just giving the country its own culture. When World War II was in full force, there was a shortage of rice and the government were determined to promote dishes which used noodles instead. Rice noodles were much cheaper to produce! During the nationalism campaign by Phibun, it was also seen as highly patriotic to indulge in Pad Thai. By the late 40s, this healthy and economical dish was a staple for the average Thai family. Nowadays, Pad Thai can be found in every corner of Thailand and in Thai restaurants around the world, too. So now you know the history… have we tempted you to sample ours? Make a booking on our website or pop into the restaurant – we’re open every day for lunch and evening sittings! We Were Featured in The Chester Chronicle!